On August 6, 1783, Empress Catherine II decreed that, «From the villages we have acquired from the counts Orlov… we command that the Gatchino farmstead with the house there, with all the furnishings there, and marble things, the armory, greenhouse and materials, and with the 20 villages belonging to that farmstead, be given to Our beloved son, the grand duke…» Thus Paul I, the heir to the Russian throne, came to own the Gatchina grounds. Gatchina became Paul’s favorite retreat. Like the other imperial palaces of the Russian capital, Gatchina is a unique system of parks and palaces; it is an ensemble of marvelous beauty and harmony. 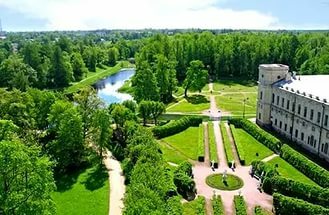 The Gatchina Park with an area of 700 hectares one of the best landscaped parks in the world. The Serebryanoye, Beloye and Chernoye lakes were created with the help of dams that hold to this day. It is the lakes that make the park so uniquely enchanting. The shores of the lakes were cut to create deep bays and long peninsulas, and the lakes have numerous islands. Winding paths follow the shoreline. These paths converge and separate, bringing us to the water’s edge, or leading us off to a dark forest. Each turn reveals new scenes. The park preserves a few oak trees that are more than two hundred years old. The palaces emerge from the greenery. The little Priory Palace was built for the Maltese Order of St. John of Jerusalem. The ensemble’s centerpiece, the imperial palace built by the architect Rinaldi, displays the early Russian neo-classical style. The palace stands on a rise and is illuminated by the sun throughout the day. From the observation points on the palace’s high towers the park can be seen stretching into the distance. The chiming of the tower clocks rings out over the lakes and islands, uniting with the bells of Gatchina’s churches. On cloudy days the palace is gloomy, like a foggy sky, but on a sunny day it glows a golden yellow. A stone staircase leads from the palace’s cellar to a mysterious underground passageway with a length of 120 meters. It is always damp, cold and eerie in the passageway. Torches shine dimly from the walls, and the sounds of footfalls on the flagstones echo under the vaulted ceiling. The exotic «Echo’s grotto» marks the exit from the dark tunnel. If you say something loudly in the grotto the words echo all along the tunnel. Near Echo’s grotto a large granite bowl is submerged in the earth. The edges are curled like the petals of a stone flower. In previous centuries the bowl would fill to the brim with water rising from underground springs. The Chesme Obelisk, originally erected to honor the brilliant Russian naval victory in 1770, is one of the park’s oldest features to have survived. It is one of the most beautiful and romantic elements of the palace park. The windows of the palace’s Chesme Gallery face the obelisk. When Emperor Paul lived here this gallery with its lavish interior was often used as the throne hall. One of the park’s most interesting structures is the Birch House in the right-bank part of the palace park. From a distance it seems the house is nothing more than a stack of firewood. But just as two centuries ago when the house was built, today’s visitors are in for a surprise: there is a marked difference between the simplicity of the facades and the elegance of the interior. The pavilion was built to celebrate true conjugal love. It was a gift from Maria Fyodorovna, the future emperor’s wife, whose love, trust and understanding was indispensable. Rejected by his mother, the empress, for the first time Paul felt at home, free and safe, among family and friends with his beloved wife in his favorite Gatchina. 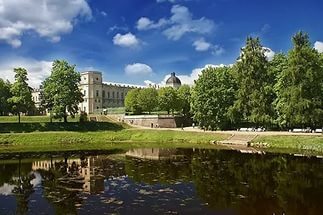 The palaces and parks of Gatchina, the underground passageways and columns, the lakes, grottos and chalets, the fields and ancient groves await visitors. An excursion through the extensive park will leave impressions so unforgettable they will last a lifetime.